A high-end Samsung smartphone caught fire inside a Chennai-bound IndiGo aircraft on Friday, creating a scare among 175 passengers on-board but the plane made a safe landing. The incident, concerning Samsung Galaxy Note 2 device, prompted the Directorate General of Civil Aviation (DGCA) to ask all airlines to ban the use of this series of smartphones inside planes, while the company officials have been summoned by the aviation regulator on Monday. The fire was reported inside the IndiGo aircraft coming from Singapore at the Chennai airport. Passengers travelling on 6E-054 flight from Singapore to Chennai noticed the smoke smell in the cabin this morning and immediately alerted the cabin crew on board, IndiGo said. The crew found the smoke to be coming from the hat-rack of seat 23C after which the pilot alerted the ATC of the situation on board. “Taking the precautionary measure, the cabin crew on priority relocated all passengers on other seats, and further observed smoke being emitted from a Samsung note 2 which was placed in the baggage (of a passenger) in the overhead bin. “The crew discharged the fire extinguisher which is as per the Standard Operating Procedures prescribed by the aircraft manufacturer, and quickly transferred the Samsung note 2 into a container filled with water in lavatory,” it said. The airline said the aircraft made a normal landing and all passengers were deplaned as per normal procedure. “This equipment (Samsung mobile) will be further examined by the concerned departments. IndiGo has voluntarily informed the DGCA,” the carrier said, while adding that safety was of the utmost priority and at no time it can be compromised. The watchdog had earlier banned the use of Samsung Galaxy Note 7 onboard an aircraft following a series of incidents of the smartphone’s battery exploding in various countries. 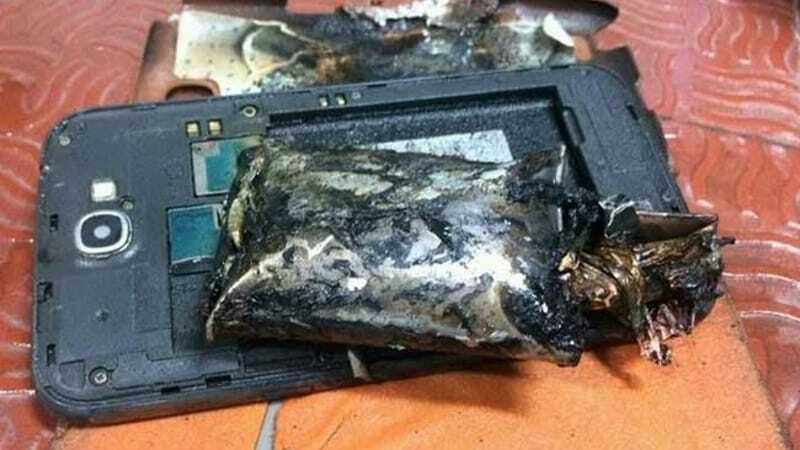 However, this is the first incident of the Samsung device catching fire onboard in India. No immediate comments was available from Samsung. The regulator would now issue a fresh advisory about these devices, while it has already asked airlines to advise passengers to switch off their Samsung Galaxy Note phones while on-board.